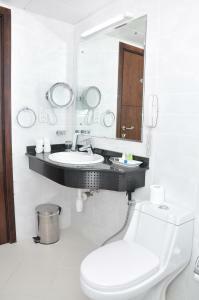 Centrally located in Abu Dhabi, Phoenix Plaza Hotel offers self-catering accommodation with full kitchens. Al Wahda Mall is a 10-minute walk and Abu Dhabi National Exhibition Centre is 10 minutes by car. 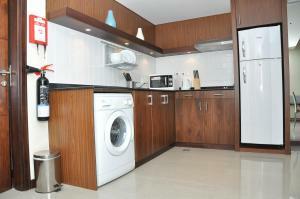 All studios and suites at Phoenix Plaza feature bright décor, washing machine and a satellite flat-screen TV. 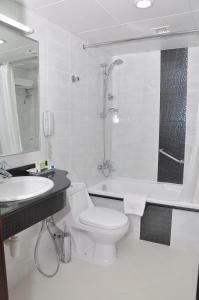 The en suite bathrooms include a bathrobe, slippers and free bathroom amenities. Guests can use the apart-hotel’s modern gym or schedule a Thai massage. The on-site coffee shop serves a daily breakfast, sandwiches and a selection of fresh fruit juice. Room service is also available. Staff at the hotel’s tour desk can arrange desert safaris or a cruise by traditional Dhow on the Arabian Gulf. 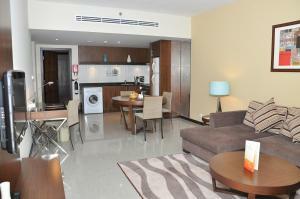 Car and bicycle rentals are also offered by the Phoenix Plaza Hotel Apartments. Many of Abu Dhabi’s shops and restaurants can be reached with a 10-minute walk from the hotel. Abu Dhabi International Airport is 20 minutes’ drive away. As per UAE law, guests are required to present a valid UAE ID or a valid passport or UAE Driving license upon check-in A damage deposit of AED 500 is required on arrival. This will be collected as a cash payment. You should be reimbursed on check-out. Your deposit will be refunded in full in cash, subject to an inspection of the property.